Montessori is all about tapping into a child’s natural inclination to learn. The classic toys that Montessori methods inspire are favorites of ours for this reason. Here are 11 of the best Montessori toys for a baby's first year, along with some tips on how to use them. The soft Montessori ball is thoughtfully designed to be easy for babies to grasp and move. Moving a ball from one hand to the other is an important skill that your baby will develop — one that requires dexterity and enhanced coordination across his body. We recommend organic cotton for safe mouthing. Practice eye tracking with babies 0 - 8 weeks by slowly moving the high contrast ball in front of your baby’s view. During tummy time, have your baby reach for, grasp, grip, squeeze, and mouth the ball. Roll the ball back and forth in front of him to begin learning about how spheres move. At the end of month 6, your baby may be able to find objects that you partially hide under a blanket, pillow, or furniture. You can start to play hide-and-seek with the ball. 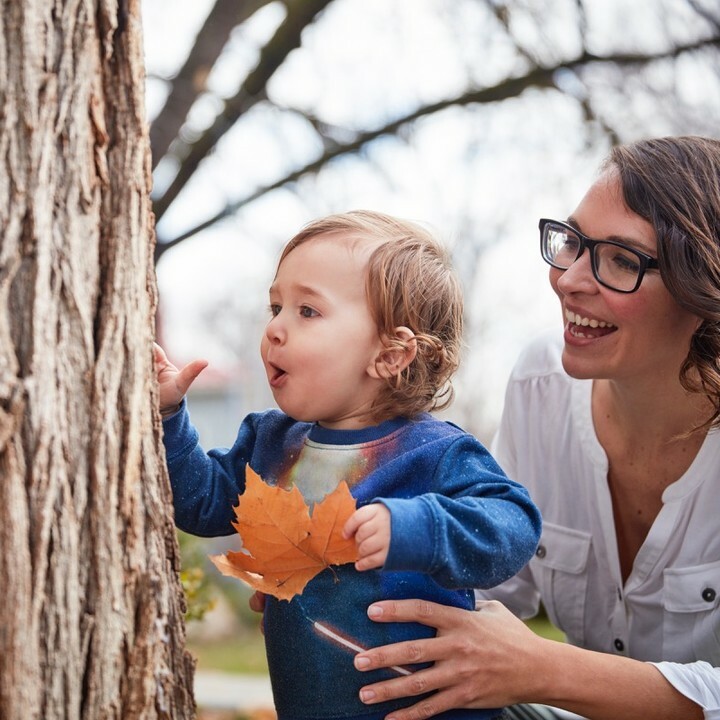 Sometime in month 4, your baby will start to look for and track the sources of sounds he hears. He’ll recognize the sound of his rattle, for instance, even when there are other noises in the background. Understanding that objects (and people!) can make sounds is an early lesson in cause and effect. This classic rattle is made with sustainably harvested wood and safe non-toxic water based paint. Shake the rattle near your baby’s face; keep rattling while moving it past his eyes until he notices the rattle’s making a sound and starts tracking the sound with his eyes. For an early lesson in math shake the rattle in a rhythm—e.g., Shake, shake, pause; shake, shake, pause—and then vary the pattern. He’ll soon be able to tell the difference between the number of shakes he’s hearing. Help your baby shake the rattle and learn that two shakes feels different from three—this helps him start building associations between numbers, sounds, and movement. Passing an object between two hands is a step babies work toward for months—getting it right involves coordination across the center of his body. Skilled hand-to-hand transfer won’t happen until sometime between months 5 and 7. It’s the basis for later motions such as dressing himself, eating with utensils, holding crayons, and running. These joined discs are a Montessori classic: they help babies practice manipulating an object in one hand and eventually passing it to the other. At first, your baby may grasp other things (like rings or rattles) while struggling with the discs, since holding them requires him to build up new fine motor skills. Holding the discs by month 4 is a major accomplishment for any baby—don’t worry if it takes some practice! When your baby plays with this classic Montessori rolling bell, he discovers new ways to coordinate his senses: the feel of the wood when he’s grasping it, the sound it makes when you or he rolls or shakes it, and how it moves when it’s rolling along. Roll the bell just out of reach during tummy time to encourage him to reach and scoot. Use the bell to encourage him to roll over. Lay him on his back and place the bell just out of reach. Watch as he pulls his legs up and starts to roll over to the side where the noise just came from—and eventually all the way over onto his belly. The first circle puzzle helps your baby develop fine motor and problem solving skills—his hands and eyes work together when he removes the puzzle piece. He’s also working on shape recognition at the same time. The circle shape is the best for first learners. We love this puzzle because it is made with sustainably harvested wood and has a baby friend inside. Long before your baby learns how to put the puzzle piece in, he can pull it out. Have your baby practice grasping the knob and pulling the piece out and then show him how it fits back in. 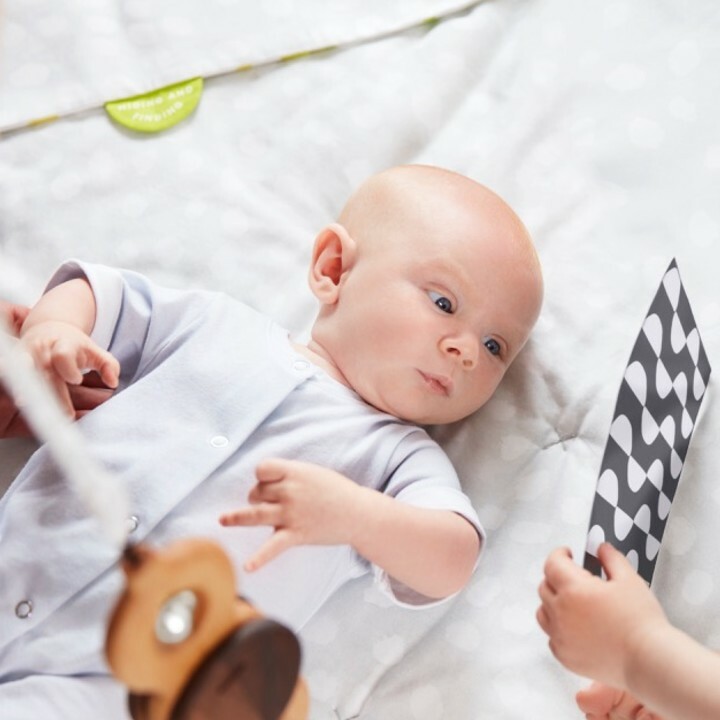 Let him explore the two parts of the puzzle by mouthing them and banging them together—banging objects together requires your baby to use both sides of the body at once, which is a very important skill. You can cut out and adhere pictures of family members or pets for a surprise inside. Offering real world glasses, cups and pitchers to babies is a long standing Montessori tradition. Speech pathologists agree - they prefer babies to use open cups when possible, as they help babies build the muscles in the mouth that are used to form sounds (and also lessen drooling). Introduce the cup to your baby once he's eating finger foods. Start with water, and model drinking from the cup for your baby. At first, your baby may just pour the water out, or drop the cup on the floor—he's learning about pouring, containing, and gravity by doing this (remember that the next time he drops something messy!). Keep introducing the cup with a small amount of water at mealtimes and eventually he will begin to enjoy drinking from it. Between months 6 and 9, your baby can remember objects from one appearance to the next. A ball dropped inside the box is only gone for a moment—which helps your baby learn that when objects can’t be seen, it doesn’t mean they’re necessarily gone forever. This concept is called ‘object permanence’. First, show your baby how the box works by holding the ball and then dropping it through the hole. Help him try—if the ball misses the hole, see if he reaches to try to get it. Resist getting the ball for him immediately—he will develop his gross motor strength by reaching across his body while sitting. He’s practicing grasping and releasing on purpose as he tries to drop the ball in the box (a skill he will continue to develop throughout his first year). If your baby doesn’t seem interested at first, try again later— babies learn to love the box at different times. This Montessori classic encourages your baby to explore and make new discoveries independently. Your baby craves touching, handling, and mouthing new and different things (especially objects from real life). You’ll soon find out that there’s an endless stream of objects inside your home and outdoors that are often more interesting to him than actual toys. The wood cup and egg will help your baby learn to use both sides of his body at the same time—a skill that’s important for things like getting dressed. He needs lots and lots of practice using both hands at once to build the speed of communication between his brain’s hemispheres. As simple as it is, the egg cup is physically fascinating to babies. In the beginning, your baby will probably just enjoy banging the egg and cup together—this is also a way to use both sides of the body at once! See if he can dump the egg out of the cup at first— eventually he'll work out how to put the egg in. Show your baby how to set the egg in the cup and then take it out again. Have your baby hold the egg in one hand, and the cup in the other, and encourage him to put them together. Have him try to repeat your action—if he doesn’t, help guide his hands while standing or sitting behind him. Between months 10 and 12, your baby learns to grasp small objects with his thumb and index finger—this is called the pincer grasp. This puzzle is designed to help him practice and reinforce this motion. Once you notice your baby trying to pick up small objects with two fingers like puffs or cereal, offer him the pincer puzzle. Guide his hand and explain how to remove the wood cylinder from the block, and how to put in back in. Once he's playing with the puzzle confidently, set the block further away from the cylinder as a new challenge—one that works gross and fine motor skills at the same time. While your baby plays with the sliding top box, he’s building hand and finger strength as well as developing his hand-eye coordination. He’s also working on problem solving skills—figuring out how to move the lid to find the ball inside. Let him watch you slide the lid to reveal the ball. You can drop other objects in the box—or put them in and slide the lid to hide them—your baby will be so proud of himself when he can do this on his own! Week 11: What is my baby's brain working on at 11 weeks old?